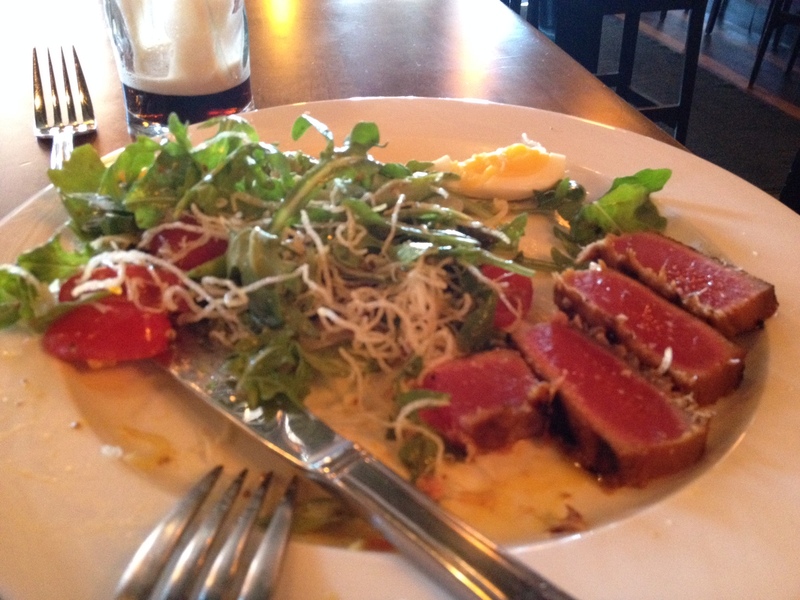 I’m on a mission to find the best seared tuna salad. 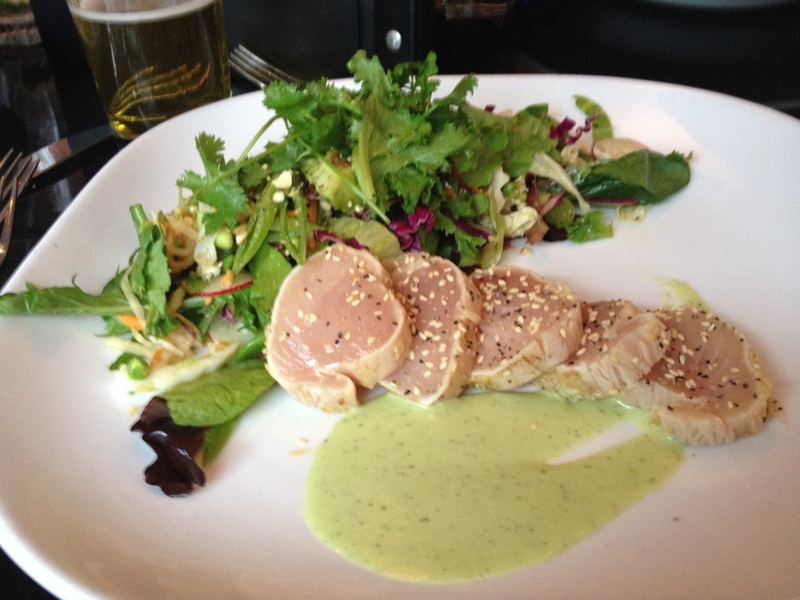 Albacore or Ahi, I wish to seek out the best combination of flavors and textures. Chain Restaurant, fast food place, or high end bistro, I don’t care, I just want to experience them all. – Tuna is plentiful but it is quite stiff, not what I am used to. The dressing and the greens are nice, mandarin orange and fennel were a nice touch. Value: if this was $18 I would order this all the time. A little pricey for me. The Tuna there was great, I did not get to snap a picture. It was Albacore Tuna rather than AHI, but it was excellent. Nice atmosphere also. I have attached a picture from the web and this is exactly what my plate looked like. 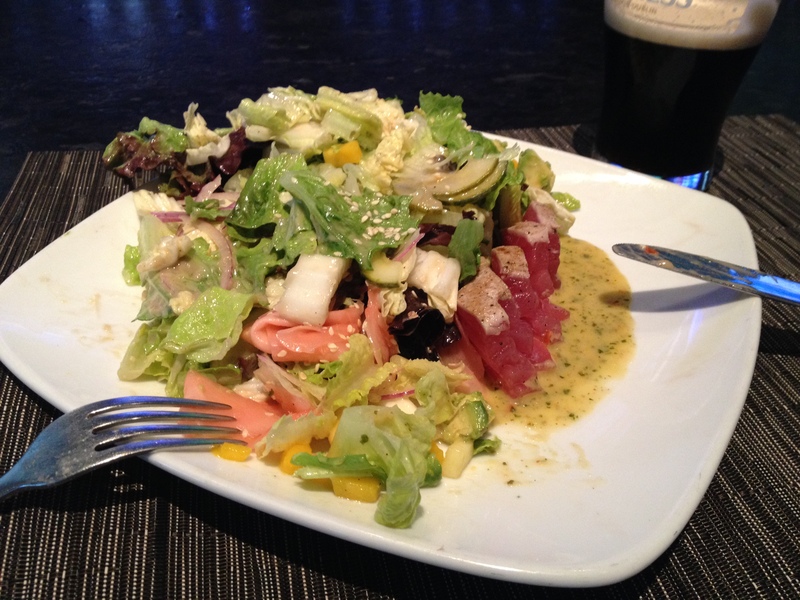 I believe this is the Ahi Tuna salad that Milestones was trying to create. It was slightly more costly @ 25.00 but it was great, I would say 10/10. It had avacado, onions, mango cucumber, pickled ginger and sesame seeds. The Tuna with the sauce was outstanding. Good quality for sure. It also came out in 10 minutes, so they know what they are doing. This is the plate after I had dug in a little. I was surprised that Moxies could put out this dish. It was very flavourful, well composed, not overdressed, the edamame was very nice – perhaps a little too much cilantro for some, but was fine with me. The tuna was excellent quality, for $19 it was well worth it. I would actually have to give this dish 10/10, and it’s Moxies Wow! 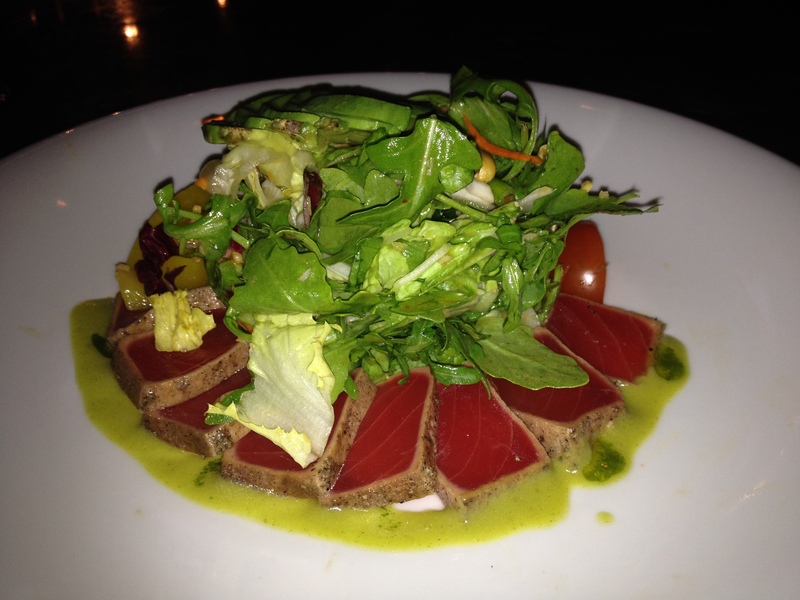 The tuna was good quality, not hard or stiff as it was at Milestones. The sauces worked, dressing was good, not too much. It was lacking some crunchy texture that I have had in other arrangements, maybe some more peanuts and crispy noodles. Overall I would say 7.7/10. It was 17.50, so I think a reasonable price. The last place I would like to highlight is CHOP restaurant near the Airport. 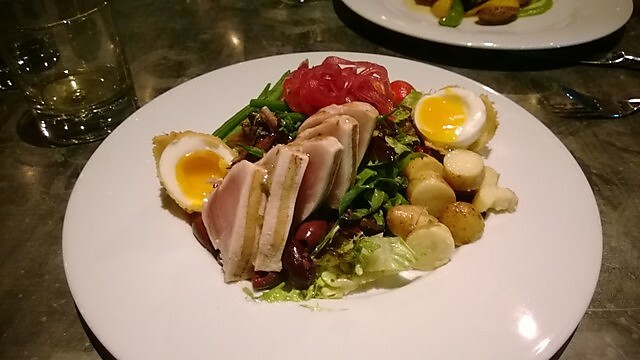 They have a great Albacore Tuna Salad, but I need some pictures and another taste, so I will be back there soon and I will post the results. Very good salad, I found it a little pricey but the dish was well executed. Nice space, well decorated. Nice front of house staff. Service was decent. I Love Sushi, my favourite. 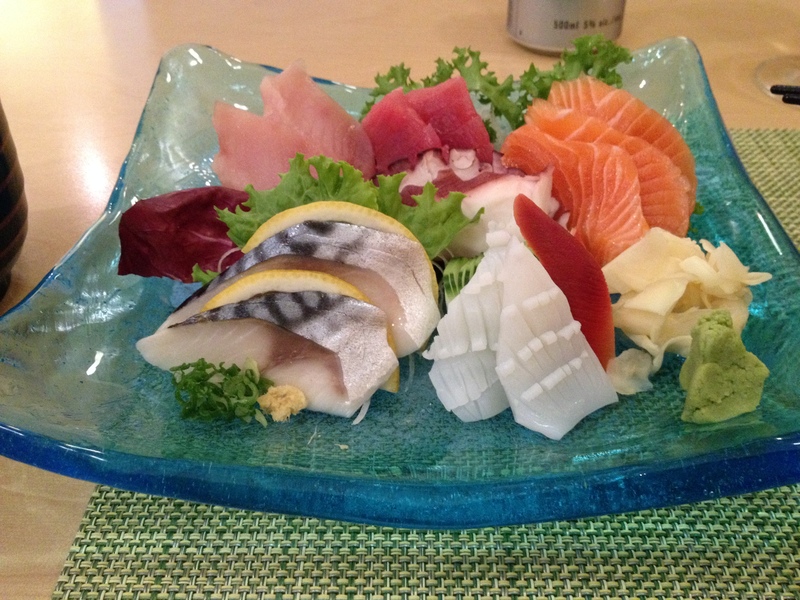 It’s great when I can find a place that serves super fresh fish, is reasonably priced and is consistent. I will try to start a thread that showcases some of the better places in the GTA. My meal at Mye2Sushi in Oakville. I started this blog to see how I could help another blogger learn to use WordPress. It will be fun and this may turn into something special.